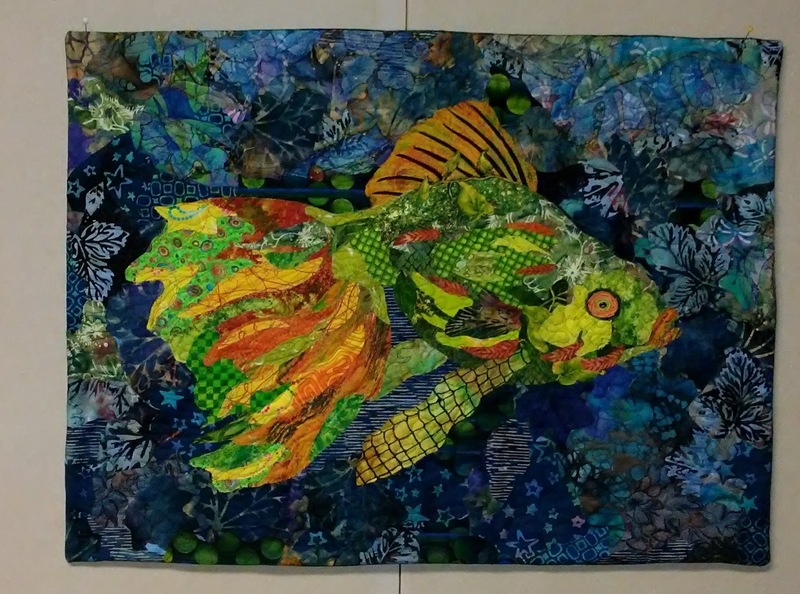 The green fish has been quilted and has its facing and sleeve done. 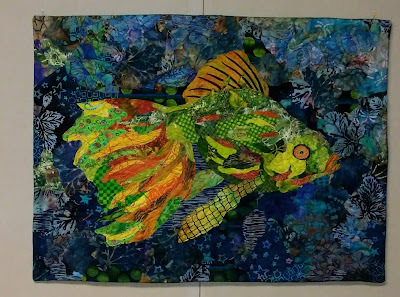 The collaged background of irregular shapes was more challenging than the geometric shapes on the yellow fish, but still interesting and enjoyable. I'll show the yellow one again below the green one. Green Carp, 24" x 18"
Yellow Carp, 22" x 17"
My guild usually has a challenge each year. 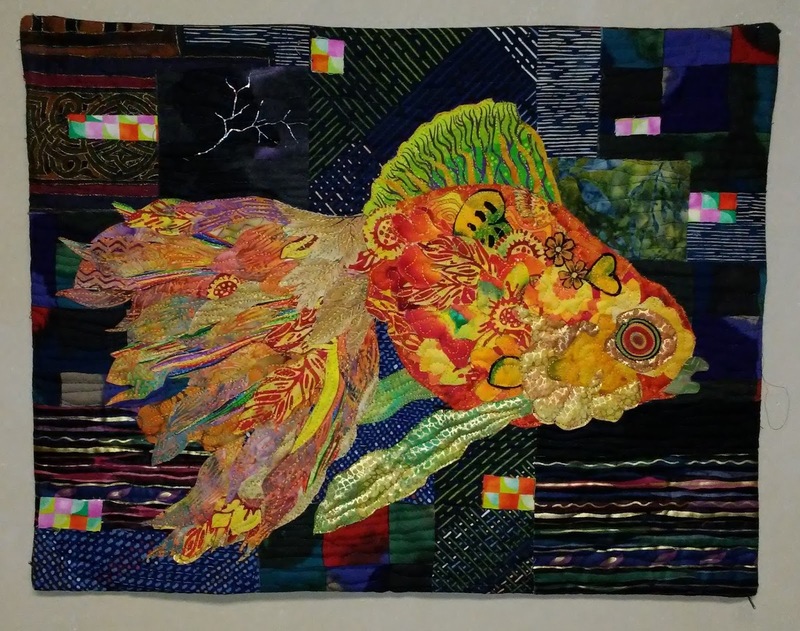 Since this is quilt show year, we didn't want to take on a huge project that might pose a hardship added to the work and preparations relating to the show. So this year's challenge involves UFOs (quilterspeak for unfinished objects) and is designed to give us all a push to finish projects as well as to encourage us to use our fabrics instead of buying, buying, buying--translate hoarding. The plan is this: we list six UFOs in number order and describe the degree of completion as of January 1, 2018. Numbers will be drawn, and the UFO corresponding to that number will be due in two months. We can earn fat quarters by bringing the finished work in on time. If all six projects are finished, our name goes into the hat for a $100 prize. How interesting to go through closets and shelves to come across these forgotten pieces! My oldest one is a half-done mystery quilt begun 23 years ago in 1994. As I recall, the instructions were confusing and inaccurate, and when I came to the step admitting some early mistakes, I gave up on it. However, there is too much fabric and time invested to discard it, so it went on my list. I just hope its number is several months away. There are several nearly finished pieces and even some that I choose NOT to finish. And that's okay. Maybe they were learning tools along the way but no longer hold my interest. I'll report back on the UFO progress.